Reverse Total Shoulder Replacement is a surgery performed toimprove shoulder function and decrease pain. This procedure is performed on patients who have suffered massive rotator cuff tears, which have led to a painful condition known as rotator cuff tear arthropathy, or on those patients who have undergone previously failed shoulder surgeries. The surgery removes damaged portions of the shoulder joint, and replaces them with a prosthesis. There are three bones that are involved in the shoulder: the humerus, the scapula, and the clavicle. The head of the humerus rests in the socket of the scapula called the glenoid cavity. The rotator cuff is made up of a group of four tendons from muscles that surround the shoulder joint, and together with the deltoid muscle, they work to stabilize the joint and move the arm. There are two types of total shoulder replacement surgery: conventional shoulder replacement and reverse shoulder replacement. The determination between which surgery should be performed is based upon the strength and functionality of the rotator cuff. For many patients, the function of the rotator cuff has been compromised through massive tears, and the muscles and tendons do not function properly. In these cases, a conventional shoulder replacement may not be effective and reverse shoulder replacement may be an option. 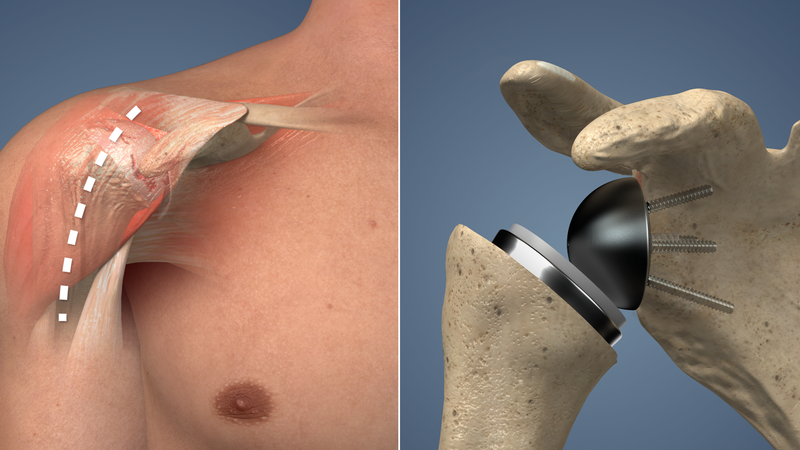 In a reverse shoulder replacement prosthesis, the ball is placed on the shoulder socket while a cup and stem replace the head of the humerus. This configuration relies on the deltoid muscle instead of the rotator cuff to stabilize the shoulder and provide joint mobility. Additionally, this procedure may be recommended for individuals who have undergone previously unsuccessful conventional shoulder replacement surgery. Depending upon your preference and that of the anesthesiologist, you will be put under general anesthesia and/or a nerve block. Your surgeon will make a single incision through the skin to access the shoulder joint. Your arm is rotated and the head of the humerus is removed. Next, a space is created in the humerus and your surgeon will insert the stem portion of the prosthesis into the bone. The plastic cup then is fitted onto the humeral side. Next, your surgeon will remove the damaged surface of the glenoid cavity. The first portion of the prosthesis is placed in the glenoid cavity and secured to the bone with screws. Next, the “ball” portion of the implant is affixed to the previously placed glenoid prosthesis, and the arm is rotated to place the ball into the socket. The incision is closed with internal sutures; and either external sutures, or staples. Finally, surgical tape or bandages will be placed over the incision. Your arm will be in a sling after surgery and until your surgeon prescribes therapy. Depending upon your specific needs, your surgeon and physical therapist will develop an exercise routine to gradually increase your range of motion and strength. Your surgeon will recommend when you can return to work, daily activities, and driving; full recovery typically takes 6-8 months. This entry was posted in Articles, Dr. Brian Cole, Injury, Shoulder, Treatment, Videos by sportsmedicineweekly. Bookmark the permalink.